Two weeks after the monster quake that flattened much of Haiti's capital, the occasional miracle is prolonging the misery of thousands of others. 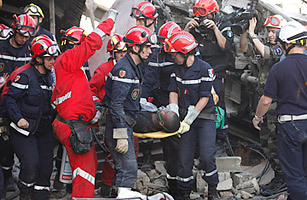 The remarkable rescue of a 31-year-old man today and of 24-year-old Wismond Exantus Jean-Pierre on Jan. 23, 11 days after the roof of the Napoli Inn fell on him, has filled many other families with hope that their loved ones may still be alive in the rubble. Not only is that hope almost certain to be dashed, it can also have dangerous consequences, say veteran rescue workers and medical professionals. Officially, the search for survivors was called off on Saturday, and most rescue teams have left Haiti. The government reckons 150,000 bodies have been interred in mass graves in the outskirts of Port-au-Prince. But tens of thousands remain under tons of rubble. Doctors say every day diminishes the already minuscule chances that there are any more survivors. But try and tell that to Margaux Delphine, a 60-something woman keeping vigil over the ruins of her two-story home in the Carrefour district. Her nephew Jean-Pierre (no relation to Wismond) was taking a nap when the building came down, and for several days afterward, Delphine assumed he had died. Then she began to hear stories about miracle survivors and wondered if Jean-Pierre, too, could be alive under the mound of broken cinder blocks and cement. By the time she heard about Wismond  who survived unhurt, on a diet of beer, cola and cookies  hope had solidified into certainty in Delphine's traumatized mind. "He was young and strong, and he was not far from the kitchen when the roof fell," she says. "I'm sure he was close enough to reach some food. I'm sure he is alive." The smell of rotting flesh emanating from the rubble of her home suggests otherwise. Two rescue teams have come through her neighborhood, and they detected no sign or sound to suggest Jean-Pierre is alive. But still Delphine remains adamant. "If that other boy could survive, why shouldn't my Jean-Pierre?" she asks. She refuses to allow her neighbors to remove the rubble, lest their inexperienced digging lead to her nephew's death. So she waits, in vain, for another team of professional rescuers, with the right machines to pull him, alive, from the ground. After a calamity of such proportions, its hardly surprising that many Haitians are in denial. "You feel guilty not to hope," says Charles Sandefur, president of Adventist Development and Relief Agency and a veteran of many disasters. "But this is not hope; it's wishful thinking." In disaster zones, false hope can be fatally harmful. Reluctance to remove the rubble because someone may still be alive underneath can lead to corpses putrefying and becoming incubators of disease, which hurts not only the people in denial but also the larger community around them. "The negative effect of this kind of thinking can have such damaging, radiatingly sad consequences," says Sandefur. Delphine's neighbors, out of deference to her age and grief, have given up trying to remove the rubble of her home. "She is mad with sorrow, but maybe after a few days she will come to her senses," says one man, who refused to give his name. And what if, in the meantime, Jean-Pierre's corpse spreads disease through the neighborhood? He shrugs: "Then we'll join him in the grave." See TIME's complete coverage of the Haiti earthquake tragedy.